Three of my friends took me out on the Christmas Walk we have here in Garrettsville every other year. It was a beautiful day to walk with Spring like weather. Went to 5 different homes that were decorated in different themes. We went into a couple of stores in town and had lunch at the Methodist Church. 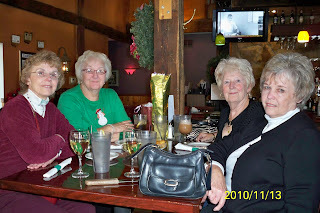 After we completed the tour the girls wanted to give me my birthday GIFTS so we went to The Mill and had an appetizer and yes, Grandma had a glass of wine. I can't deny it because it is very efferent in the picture. It was a wonderful day. On a sad note we were informed today of the passing of Ray Sheehan yesterday afternoon. I don't believe they are going to have a memorial service until Spring when all their family could be there. That's another friend Grandpa would stop to see and catch up on the town gossip. He will be missed. Love is the only thing that power cannot command and money cannot buy. "All the special GIFTS and powers from God will someday come to an end, but love goes on forever."